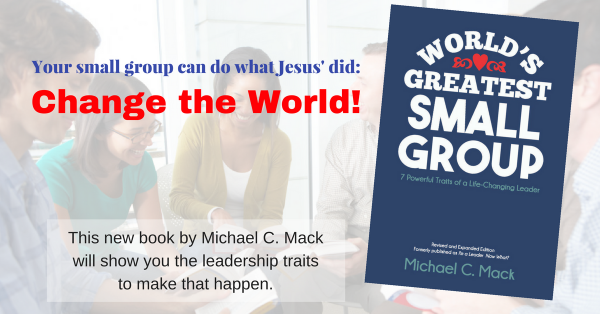 Over more than 20 years of doing small group ministry, I’ve learned this: There are many skills and techniques you can learn to help you lead a good group. But nothing else even comes close to the magnitude of the first vital sign of a healthy group. A healthy group is Christ-centered. Christ is the real leader, and the group is primarily focused on him, experiencing his presence, carrying out his purposes, and living by his power. This is where group health starts, because all the other vital signs are dependent upon how well you as a leader keep Christ at the center of your life and your group. When you put yourself or anyone or anything else at the center of the group you’ll lack the power to accomplish much of anything. So here are 4 specific ways you can make your group more Christ-centered. 1. Recognize His Presence. I begin every meeting with a worshipful prayer, recognizing Christ’s presence with us and his leadership of the group. I sometimes include Matthew 18:20 in my prayer, remembering that Jesus said that whenever two or more come together in his name, he is actually there in our midst. Then I watch for what he does during our meeting. It’s sometimes easy for me to forget that Christ is actually there in our midst throughout the meeting. He does not leave us during the Bible study. His Spirit is there to help us understand and apply his Word. He certainly does not forsake us during our prayer time. He hears each of our requests, so we don’t have to repeat them back to him at the end! 2. Depend on His Power. I find that many groups need to learn to take members’ hurts and problems to Jesus, not just to one another. I often hear concerned group members give all kinds of advice for a person’s personal issues during the sharing of prayer concerns. As the leader, ask members to simply listen, and then take the concerns to Jesus—not to a recommended book, a miracle diet or exercise program, a referred doctor, or even a platitudinous Bible verse. 3. Seek His Purposes. “What are Christ’s purposes for our group?” Begin with that question and then study the Great Commission and other passages. Ask, “Why did Jesus say he came into the world?” (to seek and save the lost), and then remind the group that just as the Father sent him into the world, so he sends us into the world (John 17:18). Ask the group to imagine some big ways you as a group could make an impact on your community. Ask them to imagine something so big that if God isn’t in it, it would be destined to fail. Then read Ephesians 3:20, and make some God-sized plans! 4. Move Beyond Study. As you open God’s Word as a small group, don’t just study Jesus as the historical figure of antiquity. Move beyond discussion about the stories of what Jesus did, to talk about—better yet, experience—what he is doing. He is indeed present in your group meetings—right now. Recognizing this will make all the difference in your group.